Video of TECNO POOL S.p.A.
TECNOPOOL designs, manufactures and installs food processing equipment. Together with their partner companies TECNOFRYER and Gostol they offer the range of machines from deep-freezing to cooling, from pasteurizing to proofing, from product handling all the way to baking. Some of the solutions are presented by managing and general director Michela Lago at the iba 2018. "Practical Solutions through Innovative Technologie" For decades Burford Corporation has been designing and creating some of the highest quality commercial bakery equipment like spray applicators and bagging machines around the globe. A number of their spraying, bagging and splitting machines is presented by Clay Miller (sales engineer) at the iba. Along with high quality equipment Burford offers an extensive range of customer and support services. Video of ESCHER MIXERS s.r.l. Escher Mixers is a manufacturer of mixing machinery for the bread and pastry industry. At the iba 2018 Alessandro Cosaro (managing director) presents their new Robotic System for the vertical storage of bowls. A second important product is the Bottom discharge mixer with a bowl cooling system, which allows to cool down the dough during the mixing process. Video of KORNFEIL spol. s.r.o. Kornfeil has been offering bakery technology since the early nineties. Now more than 140 employees are involved in the production and development of ovens for small and big bakeries all over the world. At the iba Kamila Barinova (export manager) presents the deck oven ThermoStar and ThermoStar Classic with integrated boiler room. Video of TANIS FOOD TEC B.V.
TANIS FOOD TEC is a food equipment designer process lines for bakery and confectionery products. TFT offers full-automatic plants for ingredient weighing and preparation, premixing, depositing, aeration, coating, finishing and decoration. Sales manager Piet Vader presents processing equipment for cake batter at the iba 2018. Also presented is the aeration system TFT Roto plus as well as mixing equipment. Video of Koenig Maschinen Gesellschaft m.b.H. Koenig Machinery is a leading equipment, technology and service partner of bakeries worldwide. At the iba Wolfgang Staufer (CEO) introduces the KGV plus a high-performance bread roll production line that can double the output of conventional production lines. A new generation of flexible make-up lines is introduced with the Artisan SFM, which impress by offering easy cleaning and maintenance. Video of EyePro System S.r.l. EyePro System is a manufacturer of vision inspection solutions for the baking and snack industry. At the iba 2018 Andrea Bertuolo (sales manager) is presenting their new system Multi-Eye. Multi-Eye detects and classifies foreign contaminants that are not detectable with traditional technologies as metal detectors or x-ray. Also displayed at the show is a new inspection system for the tortilla production that can also inspect the bottom side of the product ad sort out damaged goods. The family-owned company develops, produces and sells natural baking ingredients and has continued to set the standards in the sourdough-production. 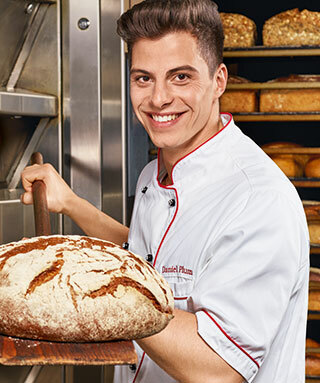 Among Böcker’s products are special baking mixes as well as fully-baked baking products. At the iba 2018 Georg Böcker (owner) presents their new pumpable Sourdough paste. A second focus of the show is a range of 12 different fully-baked gluten-free breads, buns and pastries. “HB-Technik – specialist for ingredient handling systems” Helmut Hemetsberger (CEO) presents with his company ingredient handling systems which follow trends on the markets for clean label and health products. The special product presenting at iba is the microingredient dispencing machine which is dosing the ingredients to very accurate amounts. Customers benefit from HB-Technik as a one stop shop – the company provides engineering, manufacturing, installation and servicing of the systems.